In my adventures of finding and testing back shavers, I am often surprised with the results. Some products I think would work amazingly don’t work so well and some I think wouldn’t work good, work fantastically. This keeps it very interesting to me, as both a user and a reviewer. 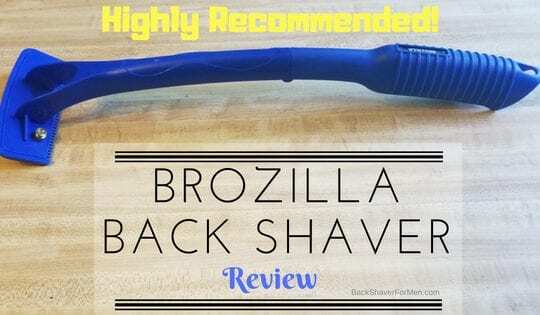 This product, OXA Do-It-Yourself Back Hair Shaver performs surprisingly well and it did pleasantly surprise me with its performance. Well, let’s see how back hair stands up to the OXA. 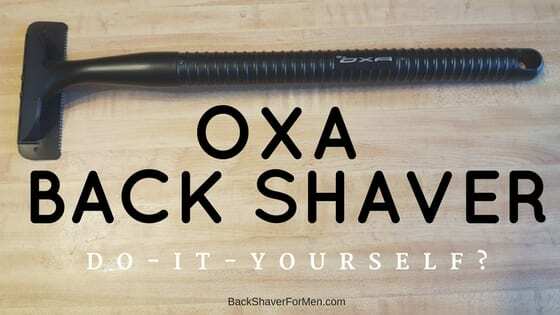 What Is The OXA Back Hair Shaver? This specific design reminds me of a combination of other back shavers I have reviewed but also unique in its own right. For example, the shaving head reminds me a lot of baKblade shaver with it’s precise placement of plastic teeth to the razor. It performs about the same as the baKblade, giving a close shave with the added protection of not having to cut yourself doing this. As both baKblade and OXA get this combination just right. Upon inspecting the razors section, I notice it has three disposable double-sided safety razors lined up side by side, much like the Bro Shaver. You can read the full review here Bro Shaver Review. 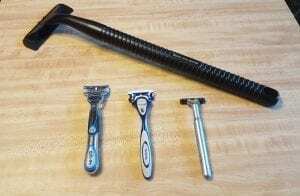 This is a closed system and the razors are not able to be switched out, and you must purchase the replacement razor when the razor is dull. 1 – (Limited amount) Card for free replacement blades (3) with contact information. Just provide your Order ID. This is what is all included when you buy OXA Back Shaver. The handle is 17 1/2 inches long, while the blade width is a solid 5 inches, the size of the actual razors width is 4 3/8 inches wide. The front of razor head has a set of very short plastic teeth that comb thicker hair before the razor cuts it, thus allowing a better shaving experience. I can tell from looking at the design of the razor that it is made up of three double-sided safety razor blades. 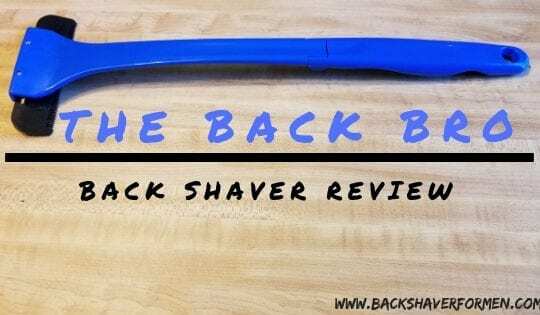 How Does The OXA Do-It-Yourself Back Hair Shaver Perform? I am very pleased with its overall performance for shaving the back. The razor was sharp and quickly dispatched the back hair upon each stroke of the OXA. It quickly had my back smooth as an old river stone. The wide blade quickly allows for fast back shaving. I had my back done in no time at all. It cuts back hair but doesn’t cut your back skin. A great combination to have. It pretty darn near safe to use by anyone, as you don’t have to worry about cutting yourself for the most part. 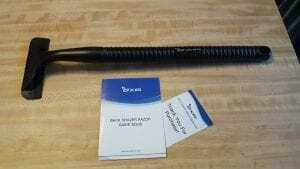 The handle is made out of plastic and is a good length for reaching most of the back. The handle allows for easy choking up on the handle, as it is the same width at the top of the handle to the bottom of the handle. A slight negative is the handle construction. As it has one ergonomic side (rounded and ribbed) (which is quite comfortable) and the underside is open and mildly uncomfortable. As this has sharp angles. This is by no means a deal breaker but it needs to be mentioned. This is I am sure just a simpler and cheaper method of manufacturing the handle. This back shaver is very light to hold and is very manageable. It also indexes well when shaving without a mirror. OXA gets the perfect angle on the razor, as it easily and effortlessly mows down the back hair with each pass. You don’t have to constantly adjust your arm or wrist to get the correct angle. Doesn’t clog even in the slightest. Hair falls away for the most part and doesn’t get lodged with the razor. ***Limited amount only*** First Come First Served. 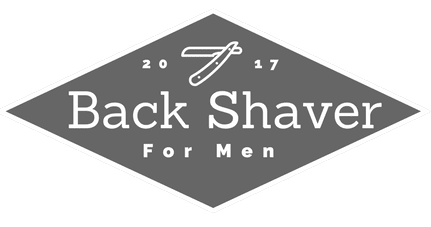 Purchasing an OXA Back Shaver you will receive a FREE card with the email address to receive a Free Back Shaver Replacement Set (3 pieces). I hear there are around 1300 units with the card left. This is a very nice offer for an extra set of replacement blades and a great buying incentive as well. Very light in the hand. The manufacturer of the OXA is the No. 1 Seller of razors in China. Switching blades is simple and fast. 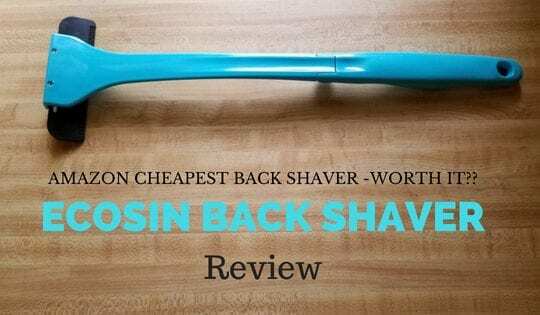 Shaving your back takes little time with this wide back shaver. No learning curve to learn how to properly use it. Decent low price for a back shaver. The design of the razor allows for a good close shave while also protecting yourself from cutting yourself. A nice combination to have, much like the baKblade, my review can be found here, What Is baKblade? Blade and replacement blades come with a cheap plastic cover that is great for storing and keeping this safe while not in use. Thoughtful! The large hole at the end of the handle for hanging in the shower or attaching a lanyard to it. Indexes nicely when shaving with it, plus you can shave by feel and sound alone if you had too. As you can just tell when you’re cutting back growth. The angle at which the razor is attached to the handle is great, they get this right and you don’t struggle at all looking for the correct angle. Very little to none skin discomfort after shaving with the OXA. Bought through Amazon and they sent me a follow up about me receiving the product as well as any questions I would have. Love this customer service and attention to details. 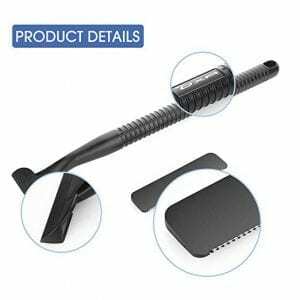 Easy to change out for a new razor and the locking mechanism firmly locks down the razor onto the handle. A secondary component of this back shaver is it makes a decent back scratcher as well. As it provides a relieving itch reliever. The handle is hollow and slightly uncomfortable due to the sharp edges on the underside that is hollow. The front side is nicely rounded and ribbed for comfort and stability. Your thumb is what experiences this sharpness from the underside of the handle. Not that big of a deal but worth noting and a slight negative. The handle is pretty much straight as an arrow and might be better if the handle had a little arch to it. Hard to reach the middle of lower back due to the straightness of the handle. Using the same arm for what side you are shaving alleviates this problem for the most part. I always find shaving my back easier after taking a nice hot shower and thoroughly drying my back off. Dry shaving is the way to go with this shaver in my opinion. I would buy the replacement 3 piece blade set right away and avoid the hassle of having to buy when you have to when the razor becomes dull from the one shipped with your OXA Back Shaver. That way, you are prepared when the need arrives. Use of a mirror is almost mandatory with any system of back hair removal. Did I miss a spot? Oh, yes I did. Let me get that. To replace the blade simply depress the two plastic tabs on the underside of the blades, as it snaps out. To insert new blade, simply line up the razor with the slotted handle and depress until you hear a solid snap. Could be used to shave other parts of the body as well, legs, chest, and arms if needed to. Rinse and clean and dry the razor every time you use it to maintain its sharpness and longevity of the OXA. A stiff small brush really helps to rid the razor of hair and skin. This coupon code is through Amazon for a whopping 30% off OXA Do-It-Yourself Back Shaver. The code is good till 6/30/2017 just in case I forget to update it after the expiration date. The design of the OXA has many great and functional features, for a good initial purchase price. I was pleasantly surprised at how effective it was at dealing with shaving back hair. Their system allows for a quick clean shave with a low probability of cutting yourself with this razor. The wide blade really reduces the amount of time it takes to properly shave your back as compared to a standard beard razor. They are relatively new on the market but their design works great. 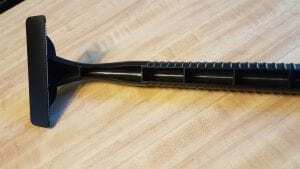 With few negatives to speak of, the OXA Do-It-Yourself Back Shaver is a solid contender for anyone looking for a well performing back shaver at a reasonable price point. Left Me Surprised At How Well It Worked. Handle straight and might perform a little better with an arc to it. 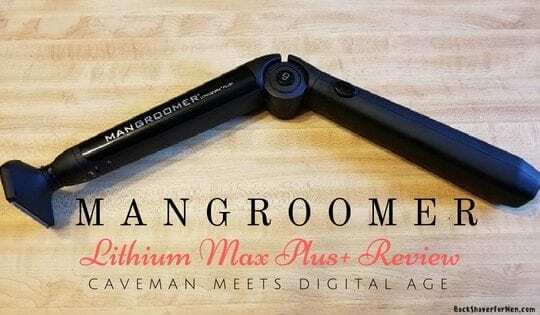 Would love to hear feedback or also answer any questions pertaining to this shaver. Please comment below. Thanks!